Well here we are at the end of February and there is still a foot of snow in my garden and I don’t think I’ve seen the grass for a whole month! It’s very beautiful but I’m tired of the subzero temperatures and am yearning for warming days. Every cloud has a silver lining as they say and this winter I’ve really embraced my slow cooking and oven as I make lots of batches of soup and stews for the family. My Spanish friend brought over some wonderful chorizo for me to cook with and so I immediately got to work with this stew. 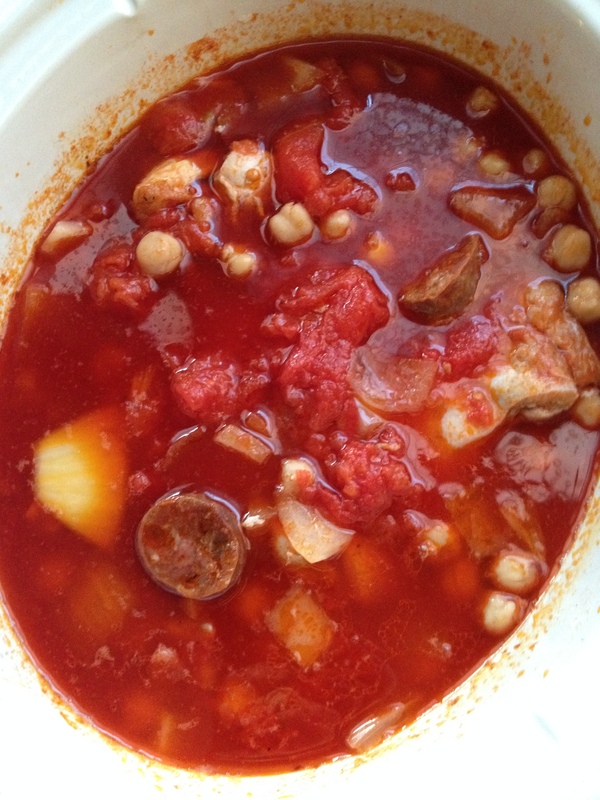 It’s a type of stew that I had many times when I was living in Spain in my early 20s: tomatoes, beans, chicken, chorizo and spices. It’s simple but warms you up on any snowy winter’s day. In a large pan, heat the olive oil. Add the chicken pieces and cook until brown on both sides. The chicken doesn’t need to be cooked through, just brown on each side. Add the chicken and all the other ingredients – except for the beans – into your slow cooker. Cook on high in the slow cooker for about 4 hours. Add the beans and extra spices to taste in the last 30 minutes.